This note describes my most remarkable (and successful) business experiments from 2017. If you are an entrepreneur, marketer, user of our products or are just plain curious – this is for you. I term myself “parallel entrepreneur geek” – my passion is solving business problems with technology and I run multiple ventures in parallel. And I’ve been doing it since 1999. 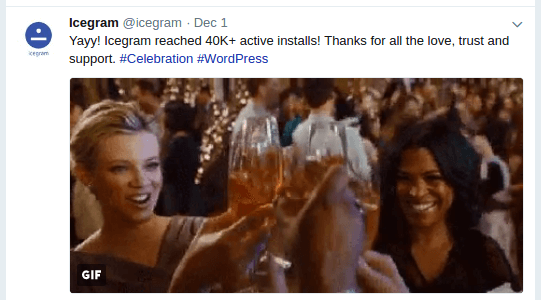 Icegram – Lead gen, optin, conversion & email marketing for WordPress sites. We have a 20 people team in Mumbai, and serve 35,000+ customers – and 250,000+ users. 2016 was a good year in terms of numbers, but I felt extremely low. I questioned my own abilities, was tired and didn’t see any light at the end of the tunnel. But extreme lows provide the best bounce back opportunities. And that happened in 2017. I created a video series to teach the 10x formula later in the year and participants reported amazing results. So it indeed is powerful. The 10x formula was my biggest discovery for the year. I was scrolling through Google Analytics screens, frustrated that the business is not going at the pace I want, the magic bulb lit up. It’s a small, seemingly trivial formula to 10x your sales. Most people don’t recognize it and keep struggling. So what’s the secret business success formula? Triple your traffic. Double your visitor to customer conversion rate. And make double the money from your average customer. That’s a sure shot way to 10x your business – with limited resources! Splitting your business focus around these three parts – Traffic, Conversion and Retention – takes care of a lot of pressure and overwhelm. I spoke to a mastermind group of WordPress entrepreneurs about the 10x formula during WordCamp Mumbai in March 2017. That discussion provided a lot of validation and insights. So I went head first on implementation! For the rest of the year, I focused on increasing traffic, conversion and revenue per user one bit at a time. With just one simple inbound marketing strategy, we doubled our traffic in just a few months. My attention was on growing traffic first, then improve conversions and then ARPU. I picked up lots of small tweaks that could improve each dimension. And a handful of big changes. We witnessed lot of changes in markets and higher competition, yet had impressive improvements in both conversions and ARPU. Putler’s conversion rate went from 1.89% to 2.18% – 15% increase despite much higher traffic. At consolidated level, our Average Revenue Per User went from $47.30 to $68.54 – a 45% jump. The numbers vary between businesses. But we’ve seen superb growth wherever we applied pieces from the 10x formula. And no, we haven’t done 10x on the consolidated level yet. But I feel a lot more confident now. Breaking down revenue targets into three distinct sub-goals relieved me of stress. Thinking about tiny improvements – “low hanging fruits” – in each area made tasks within reach. And we actually achieved them. Measuring results kept us in momentum. Want to learn & apply the 10x formula? If you are interested in the 10x formula, feel free to reach out to me. If there is enough interest, I can re-open the 10x workshop, and I’d be happy to get on a call and talk about how you can get to 10x! I’m sure you’ve heard it before. You’ve probably also created user / customer personas and avatars. Given a chance you’d advise others to “become customer centric” too!! Yeah.. I’ve done that too. This time I took it to a new level. I’ve been a long time PLF Owner and used Jeff’s method to do successful launches. It works! I did some extensive work on creating an avatar of my ideal customer (for Putler to begin with, and then other businesses). I did it while I was attending Jeff Walker’s Product Launch Formula Live event in April 2017. Here are some questions from Jeff’s training to help you craft avatars for your business. What’s your avatar’s biggest source of pain? What keeps him or her up at night? What is their biggest frustration? What scares your avatar? What is the biggest danger that they don’t even see yet? What are your avatar’s greatest opportunities? Are there opportunities they don’t even know about yet? What are your avatar’s hopes and dreams? Who or what do they aspire to be? In what ways does you avatar not feel respected? Who doesn’t respect him or her? What does it feel like for them to not be respected? What achievement would vindicate your avatar? I created multiple avatars. I realized I’m not my avatar. How they think is different from how I think. My focus while creating a product, site, email, offer or anything – should always be the prospect. I took a number of steps after this. 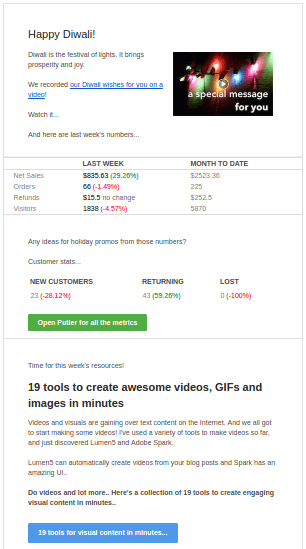 Rewrote Putler’s website copy from scratch to focus on customers. The new website was super successful largely because of the copywriting. (More about the website redesign below..) I wrote it myself – didn’t hire external copywriter. Revised a lot of our email auto responders to help customers “get the job done” first. Collected focused customer surveys within our WordPress plugins, and provided solutions based on user feedback quickly. Our WooCommerce Licensing and Serial Keys plugin witnessed an immediate sales boost when we implemented a new feature people wanted. This is counter intuitive – but changing our “no questions asked” 30 day refund policy to “if can’t resolve problem” policy helped us serve customers better. Customers liked it so much that most people who asked for a refund ended up buying more things from us! We want to help people get their jobs done, as well as grow. We created 10x Workshop (Store Apps) and Mass Influence Workshop (Icegram) for this and had encouraging response. We continued improving user experience of our products. Putler has gone through lots of little iterations and big redesign. WooCommerce plugins saw tweaks and fixes – and a vastly easier licensing system. Icegram, Email Subscribers and Rainmaker saw gallery items, Pro offerings and better integration. This list can go on.. As a matter of fact, customer avatars became foundation of a lot of work we did during the year. I kept referring to my avatars while writing an email, creating a new feature, responding to a support request.. Every step of the way. Developing authentic understanding of your ideal customer avatar is a foundation of success. Think about how you can align all aspects of your business to your avatars. Tiny changes can make a big difference. I refresh designs on our sites every couple of years. I find a good WordPress theme, and build a child theme with a lot of customizations. Wanting to avoid all that work, I outsourced an Intercom inspired redesign of Putler website in late 2016. It was the first design that highlighted Putler’s shift from desktop app to a web based SaaS. We went live with the new site. And it didn’t convert at all. So I sat down to redo the site after all the customer avatar work in April. I started hunting for the best WordPress theme. And a few trials later I nailed the best theme. After finding the best WordPress theme, I even put aside my strong dislike for visual page builders – and started building the site. I created four pages in a week. Then the visual editor bloat started killing my browser! There is no best WordPress theme out there! Stop searching for it. Sure, there are themes that sell a lot! But that doesn’t make them fit for your purpose. In many cases, you are best with a much simpler theme / framework. The theme that had impressive demo content turned out to be a nightmare. It needed a lot of tweaks and settings. Lot of visual editor setup to get things right. Almost like building the site by hand. I realized that’s how every other theme would turn out too – impressive demo content, too much work to get my own site up. What I did next, was a groundbreaking shift in my approach. Instead of building the site top-down (from strategy and vision to individual pages), I went bottoms-up. My team went through all the web analytics and user behavior data we had collected and tried to make sense of visitor expectations. Time spent, most visited pages, bounce rates, heatmaps, mouse movements, visitor flow, inbound traffic, conversions… everything. The more we analysed the better we understood. Most popular pages were home, pricing and docs. The long tail of remaining pages had very little user interest. So I decided to cut down all feature pages and just keep four main pages – home, how it works, pricing and customers. Less is more! Less pages also meant less work! I went back to Storefront – WooCommerce’s base theme. Created a child theme and focused on designing a great reading experience. I copied style and elements from Medium, Neil Patel, Native theme, Post Status, A List Apart, Basecamp and a few other sites I admired. My buddy Bhavesh from Templatic provided constant feedback. And our new theme was ready. Next I rewrote the entire text copy of the site to be customer centric. It took long three and half months to go live.. We launched the new Putler website on 16th August 2017. Want to see how the old and new sites compare? 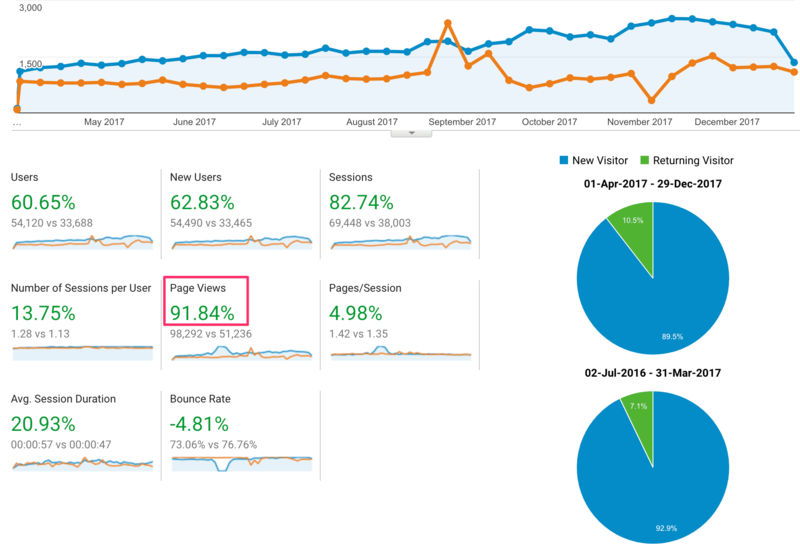 Every metric saw major improvement – much lower bounce rates, super high number of people who took a trial, time spent reading our blog posts went up, traffic increased… The whole perception of the product changed. The best WordPress theme is one you design for your own needs! Copy trumps design. Obsessive customer focus wins every time. Intuition is killing your business. Let data be your guide. Less pages, but clear communication of product and brand promise. 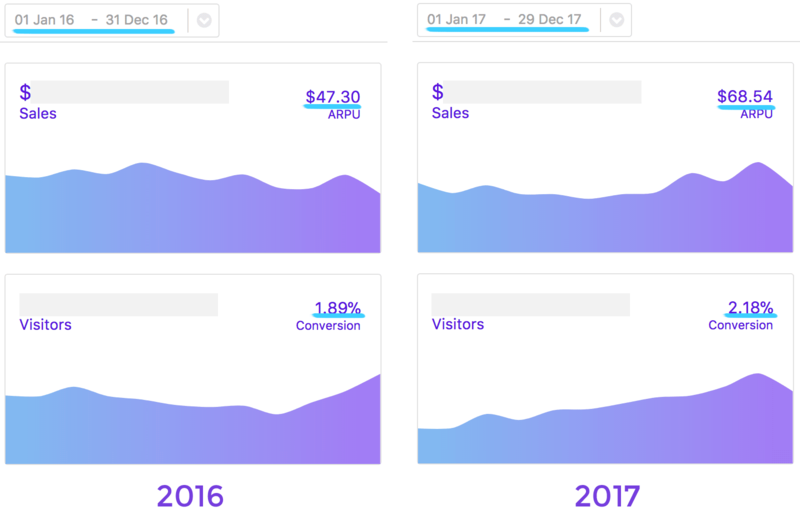 Don’t be afraid to experiment – our Pricing page was unlike any other product, and was the main reason for high conversions. Optimize design for quick scans and reading. Subtle animations, design cues and hints about the pains your product solves go a long way. Don’t underestimate the importance of visuals. It takes time to build a good site – even if it has four pages! Baby steps – in the right direction. 4. Content marketing to win the SEO battle – (you can do this too)! I’ve followed inbound marketing experts for a while, but at the start of the year, I and my team started religiously reading two experts – Nick Kolenda and Brian Dean. Nick spoke about human psychology and how they interact with your website. Dean’s blog gave us foundation in SEO, backlinking and a lot more. I was also studying behaviour finance, copywriting and science of influence. We wanted to practice what we were learning. 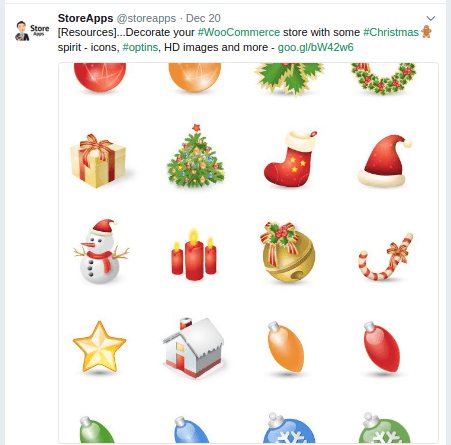 But in simple steps – so we could apply it to all three brands – Putler, Icegram and Store Apps. First, we removed all those blog posts that had less than 100 visitors. (We actually put them in “draft” and tagged them as no-follow, no-index with Yoast SEO plugin.) This drastically reduced the number of blog posts. We then quickly improved readability and SEO of remaining articles. One big lesson from Brain Dean was to write long, relevant content. So we even tried merging a few articles into one and adding content to shortlisted blog posts. Then we applied the new theme and did some styling / formatting improvements for better presentation and readability. Better time spent, lower bounce rates, higher number of pages per visit. It also helped the articles get better SERPs. 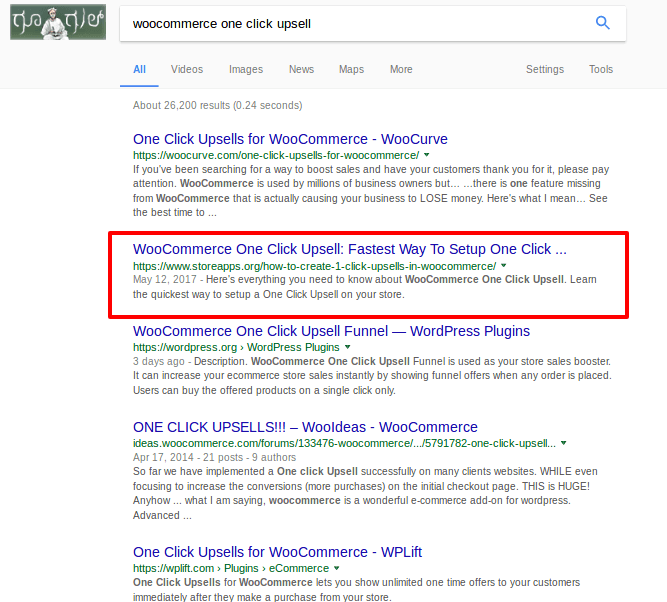 In a matter of two weeks, WooCommerce One Click Upsell, one of our article on StoreApps reached the first page of Google. We were now ready for Phase 2! The advice from everywhere was to create in-depth, highly informative and engaging content. Long content increases time on site, generates trust and can also increase pages seen in one visit. All these factors are super positive signals for Google. But how do we begin? I used few tools like SEMRush, Ahrefs to get insights about our product niche and the keywords competitors were rooting for. Next we made a list of all the low hanging and secondary keywords. I refined them further and picked up a few blog post topics where we can use these keywords. I then made a rough outline for each article, wrote a bit about what detail I want, and outsourced writing these articles to multiple freelancers. Within a month we had around 15 long, keyword rich, best in class content pieces ready. We edited them and put them up online. We also worked on design and styling. More for some articles we were really keen on. First rank in Google in some cases, first page in many. Jump in traffic – as high as 3x – coupled with improvements in all other metrics. 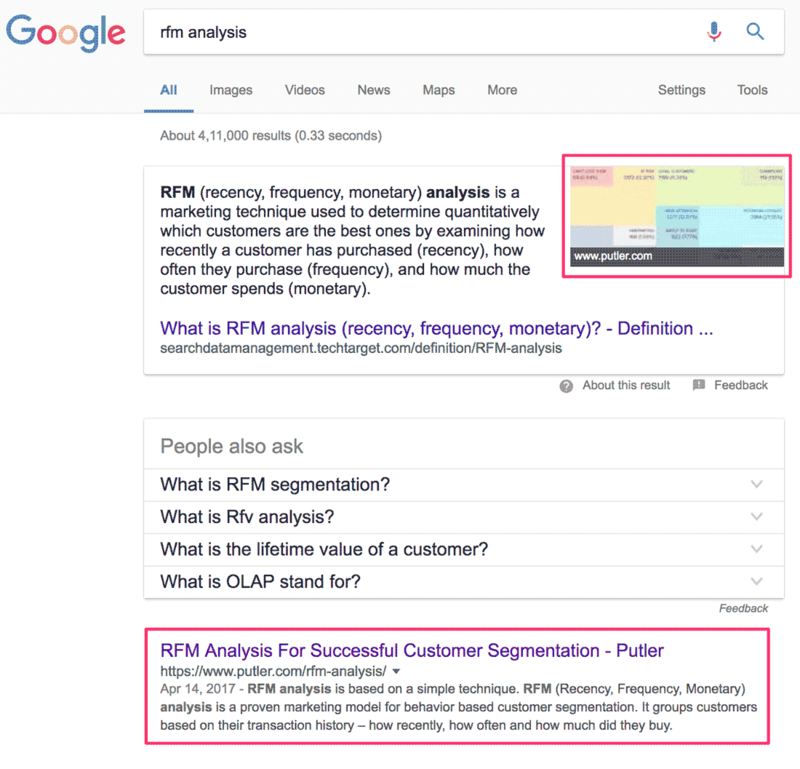 The RFM analysis article even got picked up in Featured snippet. SEO and organic traffic still works. Quality matters more than quantity. First cleanup, recycle and rework old content to improve SEO. Then develop the best content on the Internet for your selected keywords and watch Google send you a whole lot more visitors! Delegate and outsource to speed up. I used videos and webinars in 2011-13 after first learning the Product Launch Formula, and being inspired from Brendon Burchard, Eben Pagan and Gideon Shalwick. I left using videos after that as I focused on building products and WooCommerce. I picked videos after the site revamp. Creating videos is insanely easier now. But making good videos still requires art! Invest in good equipment. Tripods, green screen, good microphones, lighting… These go a long way in giving you good raw footage. Fixing bad footage is impossible. Shoot with two cameras, two different angles. Write a script. Refine it, rehearse it. Invest in a teleprompter. Look into the camera lense. Relax. Be yourself. Be natural. Audio quality from different microphones will differ. My Blue Nessie produces much deeper voice than ATR 3350. Finish recording in mornings as much as possible. As you and camera crew gets tired, quality of results deteriorate. Stick to simpler video editing tools as you begin. We still use Screenflow and Audacity. We are now experimenting with After Effects for titles. B-Rolls and background music can add a lot of impact – as well as distraction. So use them wisely. If you are doing screen casting, record audio first. Then record screen to match audio. Don’t worry about perfection. Get rolling and improve as you go! Videos give you opportunity to connect, educate and establish trust. Consumption of online video content is only going to increase. If you are not already creating videos, now is a great time to get started. Investing in a good setup and preparations go a long way in creating a good video. Editing, audio and post processing is also important. But the most critical factor for in-person videos is how you look and sound on the video. And the trick is to be natural! Social media is a huge part of our lives. But handling a social media account for a brand can be tricky. You need to find voice for your brand, understand your followers, track their most active time periods and consistently post engaging content. The past years, I used Hootsuite to schedule a number of tweets per day. We tweeted at least 6-8 times throughout the day. Yet the engagement wasn’t as expected. The posts got minimal impressions and almost zero retweets or likes. This year we spinned things a bit. Instead of scheduled tweets, we did personal tweets. We started observing what caught followers’ attention. Tweets that created value – created higher engagement. We also used images and animated GIFs instead of plain text. This not only added a fun element but also improved impressions and sharing. Overall, we were on a social media “diet”. We’ll probably do better in 2018! Use GIFs, videos and images on social media. Track the time and type of posts that get maximum engagement and shift gears as needed. We’ve used email marketing from the very beginning with varying degree of success. I’ve started a monthly newsletter on Store Apps at three different occasions without success. It takes work to put together a monthly newsletter. It takes creativity to make people open your emails. It takes persuasion to make them click on the links. We focused on increasing engagement – higher open / click rates and lower unsubscribe rates. We improved our segmentation – sending emails based on product / lifecycle of product usage. We used more HTML emails this year than plain text. We even tried festival themes successfully! Adding “WooCommerce” in subject line increased open rates! Same for emojis. 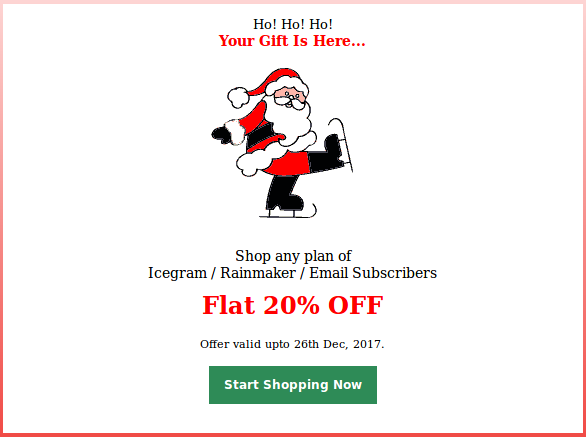 Offers / discounts got maximum clicks. But targeted emails sent to smaller lists gave even better results. We started a weekly newsletter for Putler users – this contained their key stats from last week, an intro content from us and two useful resources from around the web. It took some time to create all this content, but results have been very encouraging. Educational auto responders on Email Subscribers and Icegram continued generating user interest. People actually asked us to send more emails (after our email sequence ran out). We rewrote the autoresponder sequence for Putler, making it more task oriented – as well as friendly. We also cleaned up our lists – removing bouncing and invalid email addresses. Shorter emails worked better for quick calls to actions. Longer ones to build relationship. There is no problem sending too many emails. The problem is too irrelevant emails. We certainly improved our open rates and CTRs. Plus the autoresponders and weekly newsletters started getting replies. Spend time writing, designing and testing your emails. Keep them personal. Segment your list for better results. Focused emails with clear calls to action give best results. When I set out on the 10x journey, I knew that “what got me here, won’t take me there”. We needed experiments and new methods in all areas of business. If you’ve read this far, you already know about what worked for us in marketing and customer satisfaction this year. Now let me quickly share some insights from team productivity, technology and product management. Our tech team is divided by business units – Putler, Icegram and Store Apps. After a review in May, we decided to do a big hustle for Putler. We listed things to be done, explained it to everyone and the entire team worked on Putler for the next 10 weeks. We experienced many hiccups, but the end result was tremendous progress in Putler’s roadmap. We built a lot of microservices, improved user onboarding; built a universal avatar system for products, people and organizations; added subscription reporting; created a user profile enrichment system like Clearbit or FullContact from scratch; built RFM (recency, frequency, monetary) segmentation and a whole lot more. The “big hustle” got the team even closer, created momentum, provided ample learning opportunities and gave a big boost to product quality. Teams switched back to working on their own products after that, but we kept 10 week iterations, and kept hustling for individual products. This method helped us launch design gallery in Icegram, premium version of Email Subscribers and carry out number of WooCommerce / WordPress compatibility updates for Store Apps plugins. We hired our first remote member! And he’s been awesome! Our team also participated, spoke at and contributed to WordCamps, WooCommerce and WordPress. Developing good products takes time. Cross team hustles and 10 week iterations along with daily standup meetings, regular reviews and strong focus on UX helped us a lot in 2017. Building microservices and API driven architecture for code was also super successful. That’s a long, and hopefully useful, wrap on 2017. I’ve talked about what worked for us. But there was plenty that failed. We faced a lot of challenges, delays and even blunders. 2017 also threw challenges at me on personal front.. I lost my father-in-law after a battle with liver cancer. My dad was diagnosed with prostate cancer and took a three month long radiotherapy treatment. He also had a near-death experience in between. I stopped running and exercise, put on belly fat and lost more hair. Yet we experienced all the success I wrote about. I consider myself blessed to have the family, friends, colleagues and customers like you. You caused all this success and glory. Thank you! Why not share your top lessons from 2017 with others in comments here? You never know your one comment can change someone’s life! A lot of insights here. Congratulations on the huge success Nirav! And the entire team as well.